Most of the streams, rivers and creeks in communities have eroded banks and unstable channels caused by changes in hydrology due to agricultural and urban landuse practices. Stream corridors and the flood plain buffers along each side of a stream serve as multi-purpose green infrastructure, providing area needed for floods, to stabilize and maintain stream channels, allowing for the installation and maintenance of infrastructure, and offering community enhancing amenities such as trails. Once streams banks are allowed to erode they can be difficult and costly to repair. Especially in an urban setting, where streams are fragmented by residential lot ownership making it difficult to get full cooperation for a project that treats the stream as a “system." Stream bank and channel stabilization is a complex process involving a comprehensive survey of stream bank, bed and channel characteristics and engineering design for successful stabilization. 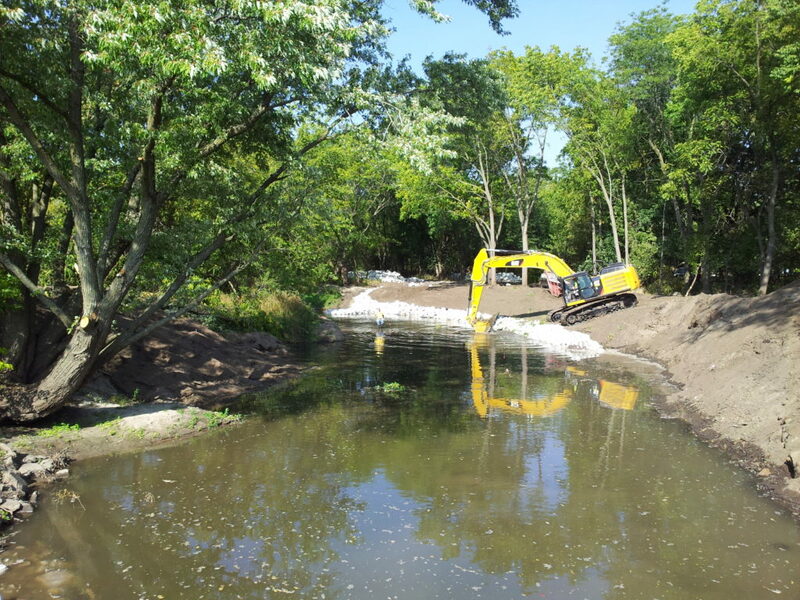 Luckily, the Iowa Department of Natural Resources has developed a decision-making tool to help guide successful streambank restoration projects. Check out the River Restoration Toolbox for more information. There are many potential practices that can be utilized to repair stream function, often used in conjunction with each other. The following list of practices is not exhaustive and definitions are provided from the River Restoration Toolbox. 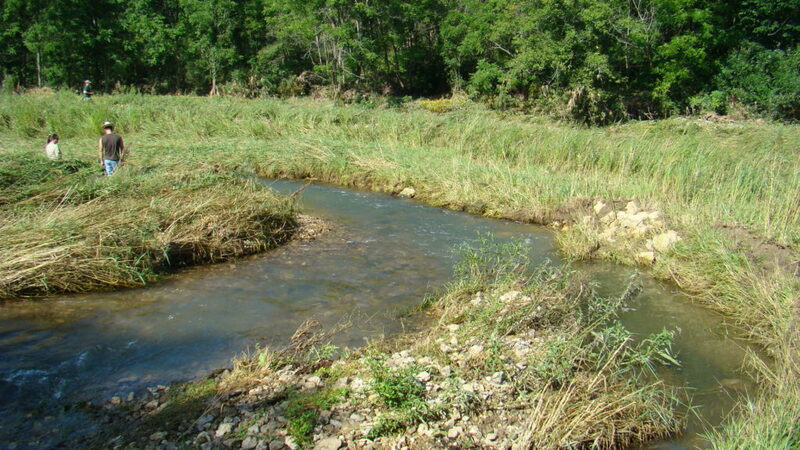 Grade Control: Grade control provides vertical stability in a restored stream. Such practices can also prevent relatively stable sections of upstream channel from becoming degraded, which can lead to years or even decades of excessive erosion. other engineered, flexible revetment techniques such as riprap and sheet pilling because of the aesthetics, energy dissipation, and natural function of the vegetation. because they provide cover, reduce sediment and nutrient delivery, and provide channel roughness during flood events. systems. A river system includes not only the river channel, but also its interrelated components including adjacent floodplains, wetlands, and accompanying riparian communities. Creating the stable form that incorporates functions necessary for success involves re-establishing physical stability integrating the processes responsible for creating and maintaining the dimension, pattern, and profile of rivers. Streambank Toe Protection: Streambank toe protection/stabilization techniques protect streambanks from high velocity flows and provide near bank stress reduction. Streambank toe protection/stabilization techniques include a variety of structures. Dam Mitigation: Dam infrastructure may need to be removed or mitigated for various reasons. Many dams constructed in Iowa are aging and/or at risk of failing, which can be a public safety hazard and economic liability. Others may be no longer functional or causing unintended issues such as impeded sediment transport, reduced aquatic habitat, barriers to fish movement, and diminished recreational activities. Culvert Adjustment: Culverts designed and constructed in an ecological manner provide floodwater conveyance while maintaining transport of sediment, ecological connectivity, and fish passage. 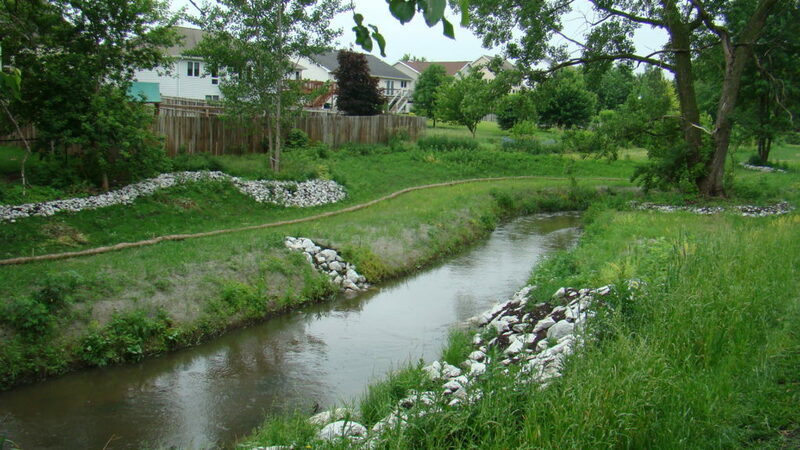 A properly designed culvert can reduce maintenance, prevent erosion, which in turn results in cost savings over time.